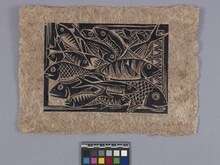 Item number 2837/1 from the MOA: University of British Columbia. This information was automatically generated from data provided by MOA: University of British Columbia. It has been standardized to aid in finding and grouping information within the RRN. Accuracy and meaning should be verified from the Data Source tab. 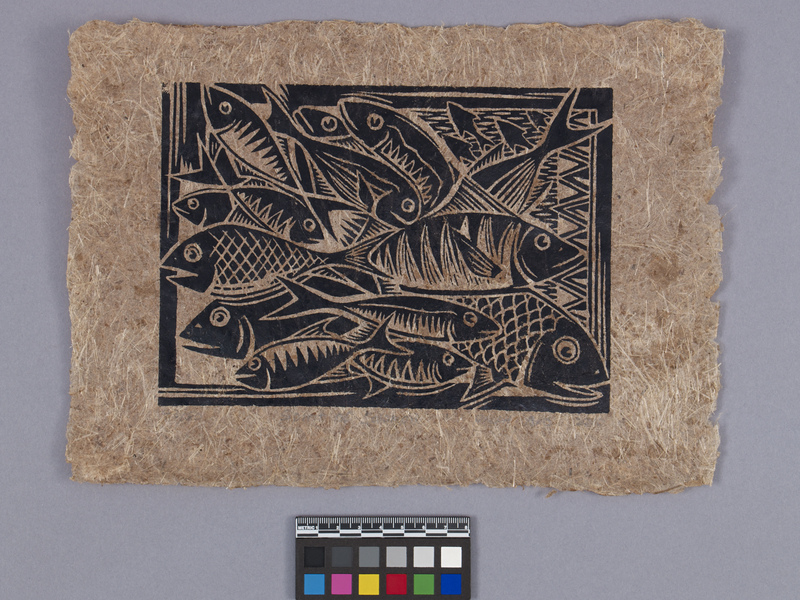 Horizontally rectangular woodblock print of a rectangular mass of fish, filling most of the frame and pointing in several directions, in black ink on handmade banana fibre paper. "Ralph Ako Spirit of Solomon 2010 43/80" written in pencil below image. This data has been provided to the RRN by the MOA: University of British Columbia. We've used it to provide the information on the Data tab. This work is licensed under an Attribution-NonCommercial-NoDerivatives 2.5 Canada License. Permissions beyond the scope of this license may be available by emailing info@moa.ubc.ca.